It’s Plastic Free July, and the UC Sustainability Office wants to remind you of one of the easiest ways you can ditch single-use plastics in your life this month – by simply remembering to BYO cup for your hot drink! Not only will you save up to 50c off your hot drink, you’ll be saving the planet, one coffee at a time. We like the sound of that! Don’t forget these discounts apply for the entire year, so if you’re not already, this is a great time to start. Plastic Free July is a great time to rethink the way we are using plastic in our every day lives – especially the types of plastic that we use once (sometimes for less than 20 minutes) and then throw away. These types of plastics are what we call ‘single-use’ plastics. The problem? There is no ‘away’. These single-use plastics often aren’t recycleable, and so sit in landfill, without breaking down. So this Plastic Free July we challenge you and your friends to ditch using them for good! Single use takeaway coffee cups – switch to a resuable one, or just bring any old mug from home! Plastic bags – switch to reuseables, and carry a light mesh one in your bag so you’re always prepared. Plastic single use drink bottles – find a reusable one, and carry it with you so you’re not caught out. Plastic straws – just say no thanks! If you want to take the challenge, you can sign up at Plastic Free July. You’ll receive resources and tips and tricks to going plastic free for the month of July, or longer! No step is too small – let’s all work together to be part of the solution. 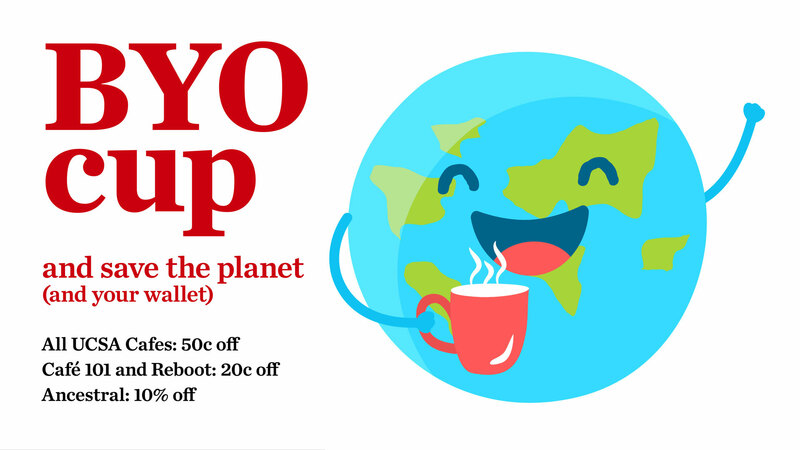 Keep your eyes out on campus for new posters advertising the BYO cup discounts, and more ways you can get involved during Plastic Free July.